Aperion Audio hits another home run with its innovative Allaire ARIS powerful one-piece speaker. The well-designed physical unit is heavy and loud, and the sound quality is impressive. If you have been shopping for a premium plug-in speaker that works either with an audio cable or Bluetooth wireless connection, stop looking and start listening to ARIS. ARIS is not battery powered, there is no remote control unit, and no wireless audio capability is built-in. You will need to plug ARIS into an AC outlet. With the optional and modestly priced Avantree Roxa Bluetooth Music Receiver, your audio source can be anywhere within an enormous range of ARIS and perform at top quality using iOS or other device’s Bluetooth signal. With the included conventional mini audio plug or the Roxa AC powered adapter connecting ARIS to an audio player, playback is straightforward. Three very different speaker equalization modes are built-in: natural, bass boost, and enhanced stereo. The latter is robust and muscular, and will be the most popular, I predict. Switching between them is done by pressing a special button on top of the unit. Enhanced stereo is indicated by the dot on the right, when looking at ARIS from the front. Because they are presets, non-audiophiles will learn to live with and love one or two or all three, and demanding listeners will be tweaking their source device equalizer settings for optimum performance. ARIS is easy to set up and use, and it looks elegant. A clever wire stand allows speaker placement at three different angles, providing for up, down, or flat positioning on a shelf, table, desk, floor, or anywhere horizontal. Volume up and down is adjusted buy pressing one or the other plus or minus button on the top front of the chassis. Three red glowing LEDs each have eight intensities to correspond to how loud or soft is the playback. Bluetooth users will set a maximum high level, and adjust their iOS or other gear’s volume for optimum enjoyment and family harmony. At full volume, stand back, way back! You will be able to fill a small stadium with music. ARIS has four driven audiophile-quality speakers, two excellent passive sound radiators, and 100 watts of massive sound. There is a mute button. Aperion’s claim of a “huge and accurate soundstage in an elegant form factor” is an accurate description. I tested ARIS on my outdoor patio, comparing it to two different favorite semi-audiophile units from another manufacturer. Notwithstanding the absent battery power and company remote control, the cable and Bluetooth audio experiences with ARIS were so superior that I always chose it above the others. 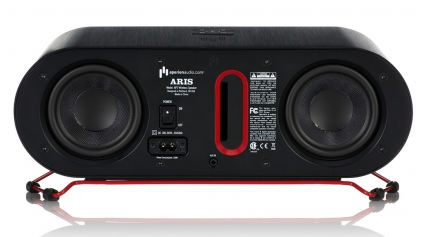 ARIS’s potent low-end and midrange blow away the competition in this price range. Hint: what sets top grade speakers and headphones apart from their competitors is not how good they sound when played loud, but rather how full-spectrum they are to use when played quietly. Aperion Audio sells a dedicated wireless card for Windows that will work with a special free iOS app. Don’t bother. It’s buggy. Instead, choose the new Avantree Roxa Bluetooth Music Receiver with its pure Bluetooth transmission. Don’t spend hundreds of dollars on ARIS if you are going to use it in a small room. 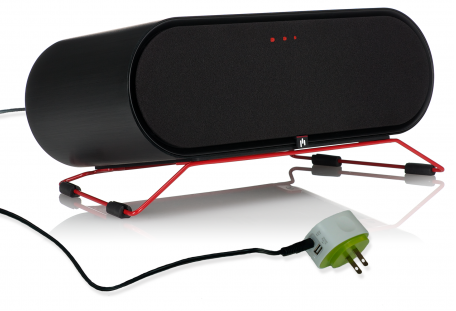 This speaker demands opportunities to be played l-o-u-d and outdoors, and in large interior spaces. • Have you ever heard the bizarre techno remix of You Can’t Always Get What You Want from the soundtrack of the film, 21? Brace yourself. • The masterful contemporary recording by Ariana Grande and Mac Miller, The Way, is jaw-dropping with ARIS. • Stand fifty feet away and listen to Gotye’s Somebody That I Used To Know, and soak in its quirky arrangement. • Riltons Vanner’s Lantar Till Sommern spreads ARIS’s sound far and wide, and blends the group’s stellar vocal performance with percussive mastery and superb bass. I mean bass bass! •One of my personal faves, Alimony by Ry Cooder, sounds better from ARIS than I’ve ever heard it. “It has a BOOM to it. Is it supposed to be a boom box?” asks a member of our listening panel. Yes, says Aperion. “Tell your readers I think it’s beautiful and elegant, with its curved, elongated shape,” she continues. • There is no real break in period for optimum sound. You may find the sound to have slightly more bass over time, but it’s ready out of the box. Near wall placement is great for increasing bass. Reviewer’s note: bass is gigantic! • Placement is going to be one of the greatest factors on how the unit sounds. We designed ARIS to project forward, so near wall placement is okay; however the further into the room you bring the speaker the cleaner the sound will become. Reviewer’s note: complete agreement. • We wanted the Allaire ARIS to be mainly used and controlled via mobile devices. We have plans to expand the cards offered for this unit. The idea is to keep ARIS future proofed, which is why it’s built like a tank and sounds amazing. We do have the HAL that you previously reviewed previously (home audio link) dongles that can be added to the ARIS, making it compatible with Zona. • This boom box needs to be plugged into electricity, because big sound requires big power. • Aperion offers free shipping, lifetime tech support, and a 30-day in home trial. MyMac Review Rating is 8 out of 10, with a recommendation.